John Rush's show is a musical experience because he plays guitar, bass, harmonica, piano, sax, keyboard and percussion during his shows. John's show is VERY interactive! He's been called the Human iPod because he puts out his 2 HUGE request books during the show and lets the audience decide which songs he plays. They pick their songs and write them on little post-it notes. During the show they stick their post-it notes all over the stage. In between each song John reads 3 or 4 post it notes to the audience and then based on audience response moves on to the next song. It really lets the audience become part of the show and guarantees they hear only the songs they want to hear. He plays Original Music and Covers depending upon what the audience requests and can play more than 60 hours of music by memory! John uses a loop machine to do live sampling which allows him to have a much fuller sound than most solo musicians, but it's all still live. John majored in classical guitar performance while learning jazz and rock. John Rush is a virtuoso guitarist with a great voice! John Rush won Campus Activities Magazine Entertainer of the Year and Campus Awards Musician of the Year! John has opened for Matt Kearney, Rob Thomas, Guster, Fuel, Eve 6, Edwin McCain, and many more. It was a crazy weekend for our Spring Fest. Hadn't rained for about 3 weeks and then it chose to rain on our busy weekend! John was scheduled to play outside but since it started raining before he arrived we moved the event inside. John was great to work with. I loved how when he arrived he did all of his own set up. That worked well since I was busy cleaning up outside from the rain. Just wanted to let you know John Rush did a great job for us yesterday at Inver. He was a pleasure to work with, great music, and the students had a fantastic time. It was a bit on the cool side for an outdoor event, but we made it work, and John, like all the artists we have here, was just great! We will certainly consider him again for Spring Fling next year! He was great! Super nice guy and the kids had all good things to say about him. I would definitely like to bring him back next year…possibly a smaller venue – something more intimate because he was in the Performing Arts Center and I think it made it seem like a lot of kids were not there. The students loved him, and there were about 50 people stuffed into the Bear's Den there enjoying the show. The show went over very well and he was a hit with our student population. John was great and very easy to work with. The students really enjoyed the performance as well. John did a great job with my request for music from the 90's as well as had good crowd participation. I was pleased on how the evening went and if I have the chance to bring John back again I would. John's performance was great! The students seemed really involved with John's act from the beginning, which was something I was concerned about. He had plenty of requests, and they were pretty diverse so I think most students were able to enjoy at least one song. John was wonderful to have on campus. His set up was easy, and was personable and easy to work with. He was great as always…he is such a joy to work with. He went over very well with the students. His wide range of music is perfect for the diversity of our students (especially since we are a community college and the range of students’ ages range from 16 yr. olds to students in their 80’s). His allowing students to select songs for him to sing from his song book was really nice. It was a pleasure working with John and he was very flexible and worked within the weather elements that were given to us. We also received a lot of compliments from the students, alumni and families that were there so we know that his performance was well received. Thank you for all of your support and we look forward to working with you in the future. The concert went very well. Jon Rush is an amazing performer. He does a very good job of relating to the crowd and interacting with them during and in between his songs. I look forward to having him again. John was great. I couldn't believe how easy he was to work with. The audience response was pretty good - the students really didn't believe they could request just about any song , but John won them over, and we had a blast. John was great. We were really impressed by his talent especially when we tested his lyrical knowledge by picking a lyric at random and he would then continue with the next line. He had a great setup with the AV equipment and lights. I’ll definitely be suggesting him to other Hopkins groups. It was a great performance. John was great, as always. I really appreciate the fact that he is self-sufficient. It really helps, especially on Homecoming Weekend when we are going in a million different directions and this year my Associate Director had a family crisis that she had to attend to, so I was left alone. Everything went great! John is a great musician and the students had a great time! Let’s talk at some point this spring because I’m guessing that we will do this again next Labor Day weekend. John was amazing!! Everyone really enjoyed him and we had a larger showing than I was anticipating. Thanks for everything! We had a great time with John. We had a good sized crowd and I heard very positive feedback from everyone. He was great & the audience loved him! I had a lot of positive feedback and mostly from student musicians who complimented his guitar playing. I personally enjoyed him as well too- his music & talking with him after the show. 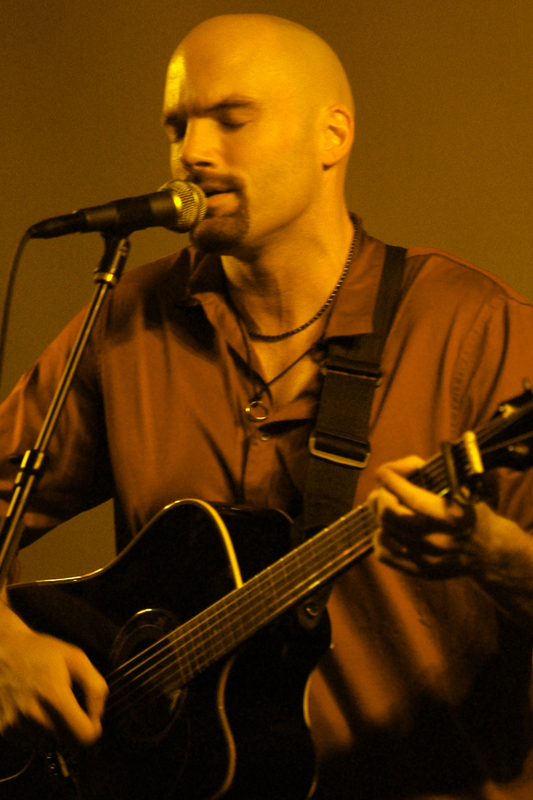 John Rush is an excellent performer and has great interaction with the audience. Besides that, he is a fantastic musician. We had about 100 come to the show. John provided a fantastic show. It was exactly what we needed. Everyone had a great time and were actively participating in the music selections. Thanks for a great performance! John is always a pleasure to work with and I'm glad we brought him back again. He's great with the crowd w d a and can pretty much play anything that anyone asks him to. He played straight through his time slot without even blinking an eye and always seems like he's having a good time. Hopefully we can get him out again next year. John was great as always. He always has a great response from the audience and is a pleasure to work with. Pretty sure that John could have a successful show with any crowd. He was outstanding!!!! The kids loved the show. And it was very well-attended (by our “small college” standards). 61 students showed up, and I was truly delighted. I have had events this year with less than 20 kids. He stayed after to talk with the students and sign CDs. He is a “class-act” and very talented. The show was great! John is always great to work with, and the audience loved him. They had a lot of fun requesting songs. Thanks for your message! John Rush was awesome!! I had a great time and all of the students had a great time too! We'd love to bring him back again in the future. He was easy to work with and very professional! It was a pleasure working with you both. I will be sure to keep Wally's World of Entertainment in mind for future events! Thank you! John was a delightful person and great performer and an excellent choice for the MC of our annual Party Smart. A number of staff people have mentioned that he is one of the finest musician singers we have had in a long time. Thank you for everything. I just wanted to let you know that John was wonderful! He had great character and a great attitude. His performance was also wonderful and the amount of songs he knew by heart was impressive. Overall I would rank him a 10 out of 10!!! Thanks so much for working with Fred and Briar Cliff in getting him here. We appreciate both your and his patience in the process and hope to bring him here again! Thanks again. Everything went great! John was awesome, and the crowd really enjoyed the show. I’ve gotten a lot of positive feedback about his performance and it worked out really well to have him as the emcee of our event . John Rush was amazing. The people on this campus could not get enough of him. With our events at the Loft this semester , we had the biggest crowd when John preformed. He was very relax and wonderful to work with and we are definitely thinking of bringing him back next year. John Rush was great as usual. His collection of music is a good mixture and gives a lot of choices to the crowd. The crowd was really responsive and most of them stayed for the duration of the show. We always enjoy having him here! Thanks so much for John this past weekend! We had a huge crowd (filled up the entire coffehouse) and everyone loved him. I believe he sold almost all of his CDs he brought and the crowd really enjoyed his ability to play anything of what they wanted. The favorite cover of the night was definitely The Killers, and I personally was real impressed with his ability to get a great sax, piano, and electric sound too, all from his acoustic. The audience wants him back next year. I know it. John played great. He really knew his equipment well, and its really kinda cool to have one guy that can do it without help. John was great! His performance at both campuses went very well. He's got such a great personality and a wonderful talent. We hope to work with him again in the future. We'd like to consider him again for next year's Fall Fest so we'll keep you posted. John's show went really well. We had close to 200 students stop by and it's our largest Coffeeshop show in recent memory. Let's hope the rest of our lineup (all from you I believe) are just as successful. From what I can tell, the students had a great time and John was easy to work with. 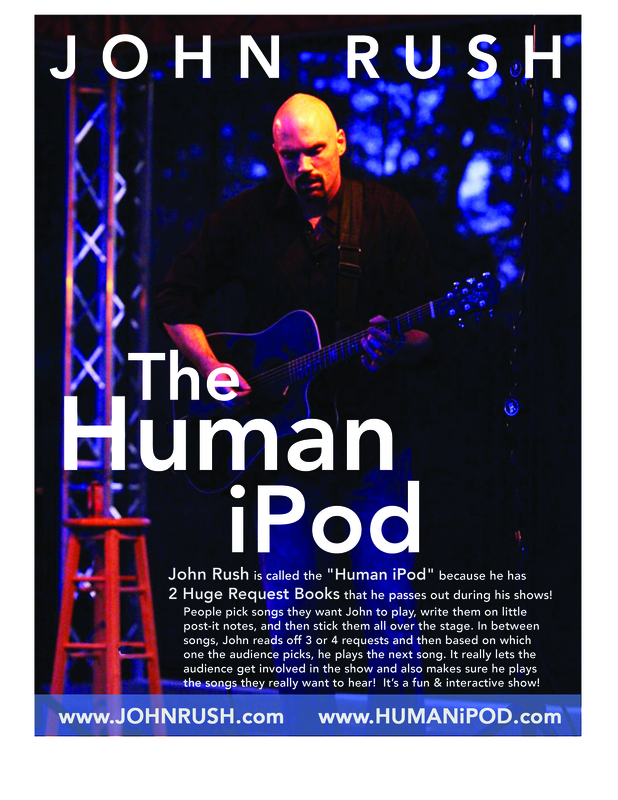 Having John Rush as a part of our Quad Fest at Illinois College on Saturday, August 30th was great! John is always very personable and great to work with. Plus, it was a great evening weatherwise so having outdoor music was a hit. We'll look forward to working with you again! John was great. He always has a good variety of songs and good participation from those in attendance. We had to do a little improvisation to get him inside because of the rain, but in all, things went very well. The show was wonderful!! The students loved it and requested him again for next year. I would call it a success. All went well at the John Rush show. We had around 40 in attendance, which is a good number for this college. The only activity we have with bigger numbers is a dance. John did a great job and I have heard a lot of positive feedback from the students. They enjoyed the evening’s show. John's performance was good. He has added more lights and sound to his show since the last time I had seen him on one of my campuses, which was nice. Any time an artist can do that it makes my life so much easier! John Rush’s performance was great, the students really enjoyed him. They would have had him play for another 2 hours!! It was a great coffeehouse performance, probably the best of our semester! He was great to work with, especially with his own sound and lights; it saved me a lot of time and frustration. Tell him thank you very much for the awesome performance! John's performance went very well. He was great to work with! The students said that he is the best dinner time performer that they have seen in our dining hall. The concert went well. John performed on the coldest day of the year in Indy (so far). It was great to have fall weather for our event. John was a trooper – I’m sure that his hands must have been quite cold by the end of the evening! Audience response was wonderful (once folks understood that they could choose songs!). We logged around 200 people throughout the evening. I hope that John enjoyed the crowd!John was great to work with. I thought it was funny that he was surprised when I offered to help him set up. It was a relief to know that John was completely capable of doing the set up himself (I’m no help, and often need to hire someone from campus operations to be there ‘just in case.’ Thanks for recommending John. We will keep you in mind as we begin to prepare for the spring. The John Rush show went great! The students really interacted with him and had a great response! He was a fantastic addition to our event and he was great to work with! He was really easy going and friendly to everyone. Thank you and please thank John for the great program! John did a great job. Students really enjoyed him. He was easy to work with and that really helps. We were outside for the event and a lot was going on, but word on the street is they liked him. Just wanted to let you know what everything with John Rush went really well. He was really easy to work with and put on a great show. Thanks for your help with everything. Everything went well on Saturday. John arrived early and got setup with no problems. The students on the programming board enjoyed working with him. His sound, as always, was amazing. Everything went well with John Rush. He was an awesome performer and the audience responded well to him. Thanks so much for checking on how things went.